Community Events (Past & Present)-lots of photos!! Franklin began as a mining community in the early 1900s. It is located just off Highway 69 Bypass which is a major corridor between Kansas City and Pittsburg, Ks./Joplin, Mo. Franklin offers residents, visitors and businesses a clean, friendly, small town environment with a moderate climate. It is a short drive to a major state university and shopping centers. Read about all the games, contests, special exhibits, programs, etc. What do Paul Newman (noted actor & director) and Joan Hornig (New York Jewelry Designer) have to do with Franklin? Read more about the nationally known Amazon Army March which began in Franklin. The Amazons were a finalist in the 8 Wonders of Kansas/People Contest. for supporting our Farmers Market. for supporting our Community Park. Visit the Travel Kansas website for statewide attractions and activities. Visit the Crawford County Convention & Visitors Bureau website for information on local attractions and activities. Franklin celebrated its 100th birthday with a week-end celebration June 23-24, 2007. If you were unable to attend this celebration be sure to order your DVD which includes a segment of historic photos and a narrative about the community. Also available are other centennial collectibles. See photos & stories about the centennial. Due to the high volume of spam I am unable to leave the guestbook open. View the guestbook. Please send an e-mail if you would like to add an entry to our guestbook for others to see. We'd love to hear from those who enjoy our website. This website is dedicated to those who have made Franklin their home through the years and to rebuilding Franklin after the devastating tornado that struck May 4, 2003. 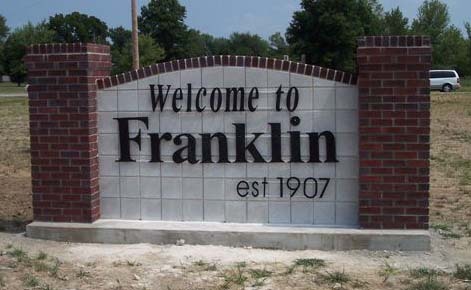 There were approximately 217 families in Franklin with a population of about 476. Approximately 1/3 of the homes were completely destroyed by the storm as well as many more sustaining major and minor damage. The tornado came directly through the middle of the town destroying the U.S. Post Office and the Community Center along with the homes. Please read about the spirit of the community and their rebuilding efforts. DISCLAIMER: This web site is provided as a public service and is entirely on a volunteer basis. Users of this web site are responsible for checking the accuracy, completeness, currency, and suitability of all information. Franklin, its residents or representatives, and the contributors to this web site shall not be held liable for any error, omission, defect, delay in transmission or operation, computer virus, communication line failure, theft, destruction or unauthorized access to, alteration of or use of information contained on this site nor for the improper or incorrect use of the information contained herein. Franklin, its residents or representatives, and the contributors to this web site make no representations, guarantees, or warranties as to the accuracy, completeness, or suitability of the information provided via this web site. 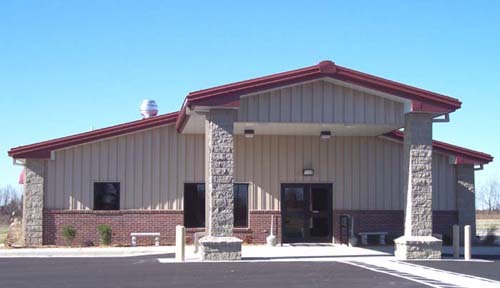 Franklin, its residents or representatives, and the contributors to this web site specifically disclaim any and all liability for any claims or damages that may result from providing the web site or the information it contains, including any web sites maintained by third parties and linked to or from the Franklin, Kansas web site. While the webmaster and the contributors to this web site strive to provide accurate and reliable information, Franklin, it's resident or representatives, and the contributors to this web site do not warrant the accuracy of every item of information provided online and accepts no liability for damages of any kind resulting from reliance on this information. Franklin, its residents or representatives, and the contributors to this web site makes no effort to independently verify, and does not exert editorial control over, information or services provided on pages outside the franklinkansas.com domain. Franklin, its residents or representatives, and the contributors to this web site do not endorse any of the products, vendors, consultants, or documentation referenced in this web site. Any mention of vendors, products, or services is for informational purposes only. The Franklin Kansas Web site, like many Web sites, is a work in progress with information being added and updated daily. Franklin, its residents or representatives, and the contributors to this web site do not collect or track personal information from its web site visitors. Generic information from server logs may be used to track the number of hits to the site, the types of browser software used, and the routes through the site taken by visitors. This information will be used only for improving service to our visitors by making the information we provide easier to find and use.